With our mix of world-leading brands, we offer the most stylish and trendiest range of fitness clothing to suit those who love to live a fit and active lifestyle. Stay up to date with our latest trends and technologies in fitness and lifestyle with the Sun & Sand Sports range of fitness clothing. The key trend we are following this season is reflective and it is seen all around providing you with an option to stay safe during your workouts. 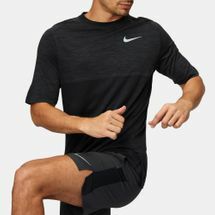 Reflective clothing combines safety and fashion as this trend offers high-visibility apart from being extremely on-point with the latest trends in fitness fashion. Enjoy a wide selection of reflective clothing at Sun & Sand Sports and work out with motivation and dedication during any time of the day. Select your favourite styles from a variety of eye-catching vests, leggings and reflective jackets and enjoy a heart-pumping cardio workout at any time of the day. Offering high visibility on even the foggiest of days, and the darkest of nights, reflective clothing offers maximum safety and superior performance to help achieve your fitness goals. With our selection you can guarantee that your fitness style will not go unnoticed with our combination of high-performance workout clothing equipped with reflective fabric to help you stand out during your workouts. The Sun & Sand Sports online store allows you to invest in the right trend and the trend to invest in this season is reflective clothing. So look no further and shop reflective clothing from brands you love and have your ordered delivered to your doorstep with the click of a button or a tap on our mobile app. Stay updated with the latest in fitness and lifestyle and subscribe to our official newsletter and always be the best dressed at your gym.